The beauty and fragrance of fresh flowers have been appreciated by mankind throughout the ages. Indigenous blossoms signify celebration and sorrow in traditional ceremonies, in every culture, all over the world. Let Bunches be your guide through the many, many choices available for every occasion. Most of all, learning about flowers and flower care should be fun and interesting, and the choosing should be joyful! You have just asked one of the most challenging questions in the flower industry! Because flowers are living things, they are quite sensitive to a combination of factors along the growing- shipping- handling- maintenance journey. Bunches only purchases product from reputable growers and brokers who take care in the production and handling of their crops. However, weather conditions and seasonal variations will determine the quality of the fresh flowers at the source. 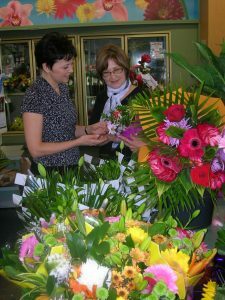 Bunches uses the latest techniques and procedures to ensure proper handling of all cut flowers upon arrival at our stores. Once you have received fresh cut flowers, or an arrangement, there are some tips you can follow to ensure the maximum enjoyment of your bouquet. For cut flowers, follow the re-cutting instructions included in your package, or refer to the section “Treating flowers like a Pro” on this website. Grooming, re-cutting and placing your flowers in a vase of fresh warm water and floral preservative, and displaying them in a cool environment, will greatly enhance your enjoyment. For arrangements which come designed into a container, immediately remove the wrap, fill the container with water (check the water level every day), re-cut stems, and display in a cool, draft-free area. There will always be some noticeable changes in the flowers as they mature. Continue to groom them by removing older blossoms, allowing the smaller buds a chance to progress. Since flowers mature at differing rates, it is advisable to completely remove some flowers from your bouquet once they have finished. The look of the bouquet may change slightly, but you will have the opportunity to enjoy the longer lasting blossoms in a livelier grouping. Should you have any further queries, please feel free to visit one of our locations, or contact us by telephone or e-mail.